*Click! Beep! Whirrrrr! 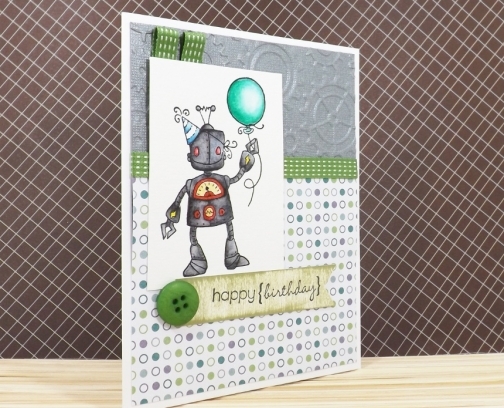 * Send this cute robot birthday card (with handmade envelope) to a birthday boy you know! I water colour painted the stamped robot image. 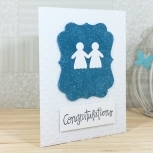 I embossed the top of the card to create the raised gear texture in a metallic grey cardstock. Green ribbon adds some texture to the piece. The robot holds a green balloon. 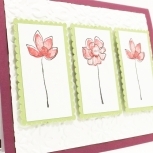 The sentiment on this card reads, "happy birthday" with a green button for more texture. 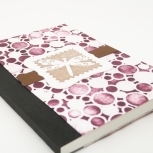 A shop label, signature and creation date appears on the back of birthday card for boy.